Are you working on identifying different objects and are you working on pre-writing lines? 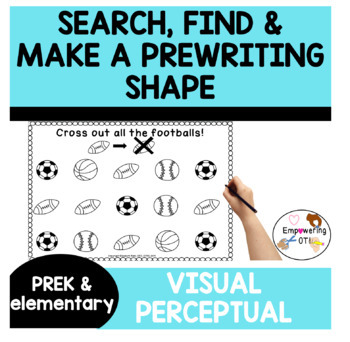 This packet COMBINES BOTH skills into an easy to use packet for preschoolers and students of all abilities. 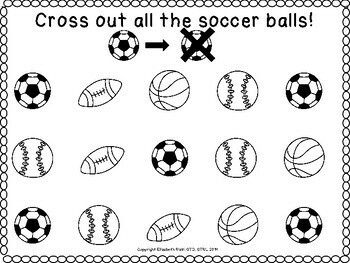 •Examples include: “Cross off the soccer balls!” (Students make a X) “Make a square around each racecar!” “Make a plus sign on the strawberry!” (Students make a +). Pages 21 – 37 are the SAME pages but come in a harder version! You can play this like a minute to win it. 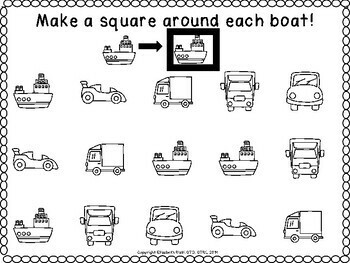 How many ___ can you find in one minute? Laminate to use over and over! This could be use as a warm up for handwriting, in therapy groups, whole class or individual students. You could have students try to beat each other’s scores or beat their own scores. Please only download if you understand these instructions and understand the nature of this product. Product ratings can make or break a store, and I want you to be happy. I am only human, and sometimes I make mistakes. Before you leave a negative review, please email me (empoweringot@gmail.com) and I am happy to try to make you happy with your purchase. CHECK OUT MY OTHER MINUTE TO WIN IT GAMES! This is perfect for RTI / MTSS as an intervention for visual motor and hand strength.This is great for visual scanning, visual perceptual skills, coordination, visual motor integration and fine motor. This is also a perfect activity for occupational therapists OT, teachers, speech pathologists SLP, special education SPED teachers and other school professionals while working on skills! DISCLAIMER: By using this, you agree that this activity is not intended to replace the advice of a physician or occupational therapist. Information provided should not be used for diagnostic or training purposes. Please speak with your physician or OT if you have questions. Stop any activity if you are unsure about a child’s reaction or ability.